No character’s past this episode but we do go back to Storybrooke. Belle puts up the cloaking spell so normal people can’t get through however two dudes get through before the shield go up. 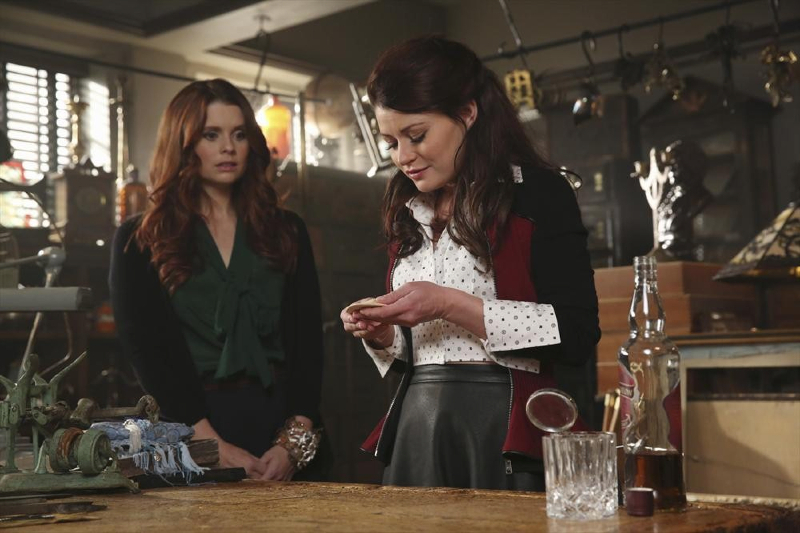 Ariel arrives though and she Belle work to find the thing Rumpelstiltskin wants. Turns out it’s Pandora’s Box which will trap Pan. However the two henchmen of Pan show up and threaten Ariel and Belle. Those guys are really Michael and John Darling, Wendy’s brothers. They are working for Pan because Pan has Wendy captive. Belle tells them to work with them against Pan to save their sister. Ariel then leaves for Neverland with the box and the message to save Wendy. Back in Neverland, Pan uses Wendy to convince Henry to work with Pan to get the magic back as the magic will cure her deadly sickness. Wendy isn’t sick, Pan is a crafty devil. 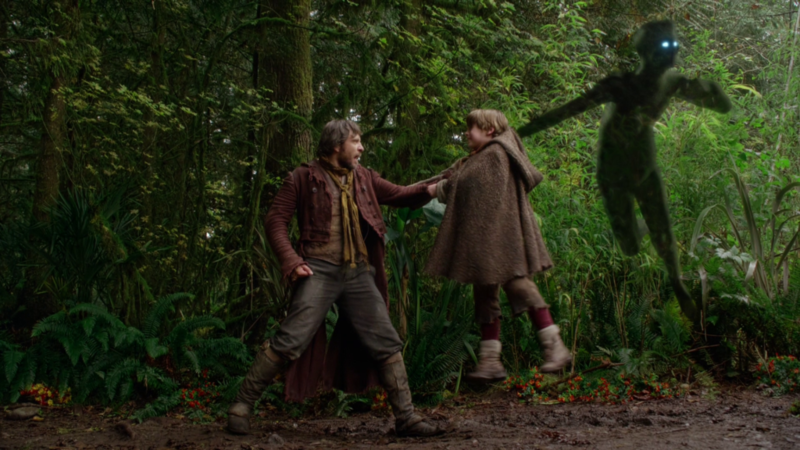 While that is going on Emma, Neal and Hook try to capture Pan’s shadow and use method for getting off the island because exit strategies are important. Neal’s coconut is the method for catching it and not a star map as they first thought. To catch the shadow they have to go to the Dark Hallows. Neverland isn’t really known for it’s placenames. However Neal and Hook are a bit at odds since the whole love triangle thing. Emma uses her new magic training to light the candle in the coconut as Neal and Hook were being held by shadows, so she didn’t have to choose. In the end they catch the shadow and the love triangle continues, they Emma makes it clear she would pick Henry over either of them. It was nice to get back to Storybrooke. Ariel and Belle were the highlights of this week. The Neverland stuff was weak and it’s getting weaker ultimately. I think one issue is that it’s alway a nighttime jungle with very little variation other than dark cave or jungle. The Love Triangle is not entertaining. Hook and Neal have a relationship but you would never know that from this episode where they act like spoiled boys trying to one up each other for a girl who isn’t really into pretend to not be into one them and has a complex relationship and child with the other. And what does all this comes to, them fighting over a lighter which symbolized Emma? Try harder show. Still better than Twilight. Oh boy, oh boy a young Rumpelstiltskin backstory? Yes please. This one is about Rumpelstiltskin. We were told that Rumpelstiltskin’s father left him too but other than that we know little except that he was raised by spinsters. So baby (kid) Rumpelstiltskin’s father leaves him with spinsters saying that he’s getting a real job but really he didn’t want him. The spinsters give Rumpelstiltskin a bean which Rumpelstiltskin takes to his father and begs him to leave the realm with him. They decide to go to Neverland. However once there Rumpelstiltskin’s dad learns that in order to make the magic he has to be a child so he teams up with the shadow, the sole denizen of the island to remove Rumpelstiltskin so his father can be young i.e Peter Pan is Rumplestiltskin’s dad. Which is another twist you could have not seen that one. It’s a bit like Vader but given the apparent ages you could NOT have saw that. Back in Neverland, the crew meets Wendy, whom at first lies to them. Oddly Emma’s super don’t go off but Rumpelstiltskin does. She tells them that Pan needs Henry’s life to preserve his life and make him immortal. You see children are not meant to live on Neverland it supposed to be a place kids visit in their dreams, so Rumpelstiltskin’s dad had a time limit which is odd since time doesn’t pass in Neverland except for the day and night. Rumpelstiltskin also hands Pandora’s box to Neal in act of trust. Rumpelstiltskin also says he can make an elixir for David(Charming) with the spring water back in Storybrooke, so that plot is getting wrapped up neatly. So the plan to save the boy is Emma, Neal, Regina and Rumpelstiltskin go to Skull Rock (because it’s shaped like a skull not merely looks like one). Since Rumpelstiltskin doesn’t have his shadow he can get through but Emma, Neal and Regina can’t. Rumpelstiltskin and Pan have a showdown that ends with Rumpelstiltskin getting trapped in the box. Emma, Neal and Regina and get in via hiding their shadows and try to convince Henry not to give Pan his heart. Henry is still operating on the assumption that he being heroic in giving Pan his heart so he does, which means Pan wins and Henry dies. This was pretty great episode. Marilyn Manson voiced the shadow which was a little weird but pretty perfect too. The character’s past was the better of the plots. It was great too see how Rumpelstiltskin was wronged by his dad. The Neverland plot was great too but a lot the exposition felt rushed given how much time the show wastes explain lots of other points and drag over plots, like David’s poisoning and Rumpelstiltskin plot elixir. All in all it was a strong episode.